Oregon State’s graphs have a specific style that can take a while to create in Adobe Illustrator, even for seasoned designers. To simplify the graph making process, we’ve made downloadable brushes that let you create these graphs in just a couple clicks. First, you’ll want to save the brush file somewhere that you can remember. Within Adobe illustrator, create your graph and enter your data. Close out of the data panel and with your graph selected, choose “no fill” from the swatches panel. Change to the direct selection tool, select the center point in the middle of your graph, and delete it. You’ll notice it retains the points where the different values were, but has turned into a circle with no pies. Navigate to the brushes file, and you’ll see we have 9 brushes to choose from. They have names like Inner Line, Inner Bar, Outer line, which relate to how the graph is put together. You can select the different brushes and see what they do to the graph. In the examples on our website you can see there are some with inner stripes, and a yellow outline, inner bars with an outline and so on. So let’s make this graph that has these notches. Back in the Illustrator file, make sure the stroke is highlighted, and select Inner stripes 2. Open the appearance window, and go into the contents of the graph. From the options panel, select Add New Stroke. Then select Outer Line 2. From the appearance window, you can select the color of the outer line, and individually change the color of each of the pies. This same style can work for bar graphs as well. Create your bar graph, enter your values, and delete the right-most points of each bar, so you’re left with lines. Select those lines, and select one of the “Inner” brushes. It’s important to note that while these are still technically graphs with the data attached to them, if a number changes the graph resets. You’ll have to reselect the brushes and colors from the appearance panel. Posted in Adobe Illustrator, Tips and Tutorials. Posted in Misc, Tips and Tutorials. Select Pie Graph Tool (under the Column Graph Tool) and make it the size you want. A Data box will appear, allowing you to add your numbers. Close the data box, select the stroke and choose ‘None’ as the color. Select the Selection Tool (V), click on the pie chart and go to Object>Ungroup, say yes to the dialog box that appears (this warns you that you will no longer be able to edit the data, so make sure your numbers are final). Right click the pie chart and select ‘Ungroup’ again. 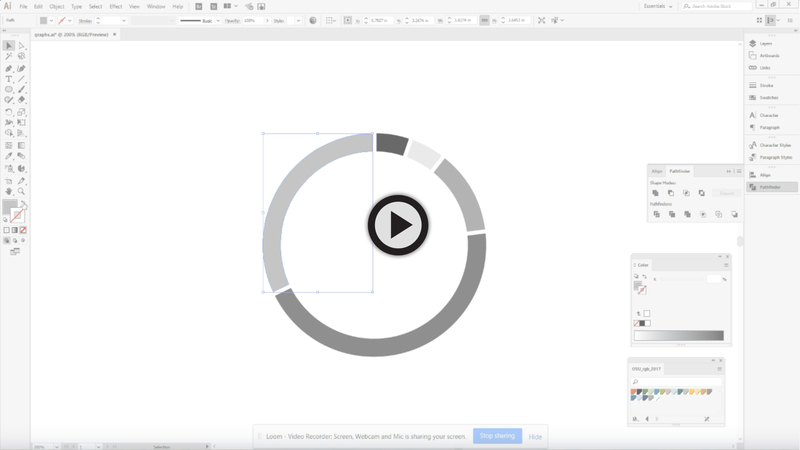 Select the Ellipse Tool (under the Rectangle Tool) and from the center of the pie graph click and hold Shift+Alt and drag to make your circle from the center. Select the fill of this circle and change it to white. Edit>Copy the white circle and Shift+click one of the pie shapes. This should have the circle and one of the pies selected, with the white circle in front. Go to Window>Pathfinder and select ‘Minus Front’ from the Shape Mode. Go to Edit>Paste in Place (Shift+Ctrl+V). The white circle should have pasted in the exact same place as last time. Shift+click on one of the pie shapes and repeat steps 7 and 8 until all of the pies have been cut. To add gaps, select all of the shapes with the Selection Tool and go to Window>Stroke. Choose a weight that feels appropriate, and choose Rounded Corners. With the shape selected, go to Object>Path>Outline Stroke. Right Click and Ungroup. Select both the outlined stroke and the solid inside color and again select ‘Minus Front’ from the Shape Mode in the Pathfinder Window. Repeat for the remaining shapes. Change the fill of each of the shapes to be the stroke by clicking on the double arrow next to the Fill and Stroke in the toolbar. Select all and from the Stroke Window, choose Rounded Corners. Copy the entire shape. Edit>Paste the shape that was made in Adobe Illustrator. Right Click>Ungroup. Edit>Copy the line and then Edit>Paste in Place (Shift+Ctrl+Alt+V). Hover over the end until the double arrows appear showing you can rotate it. Hold Shift, click and drag to rotate it 90 degrees. Copy both the lines and Edit>Paste in Place. Repeat until you’ve made a star with many points and small space between each line. Select the star only and Object>Group. Edit>Cut, select one of the shapes and Right Click>Paste Into. Select one of the shapes and go to Window>Swatches. With the Stroke selected, choose one of Oregon State’s brand colors. Hover over the shape until a circle appears. Your mouse will turn into a hand. Click to select the star shape within the container shape. From the Swatches Window, select the same color. Repeat for each of the shapes. Posted in Adobe Illustrator, Adobe InDesign, Tips and Tutorials. Many of our Microsoft templates include the Oregon State color palette, but there are other ways to import the colors if you’re starting without one. This video shows how to insert the colors yourself. Microsoft Office programs like Word and Powerpoint give you the option of choosing custom color palettes. Most of Oregon State’s templates have our color palette saved automatically, but there are a couple different ways to add the colors if you’re starting without one. The first way is to download the .xml file from our downloads and save it in a specific folder on your computer. That location is shown in the readme, and is different for Macs and PCs. The second way is to add the colors yourself. In Microsoft Powerpoint, Go to View> Slide master and on the color drop-down, select ‘Customize Colors’. I usually like to leave the first two as black and white, and change the rest to 10 of the University’s 19 colors. Click one of the colors and select ‘More Colors’ and the Custom Tab lets you add the RGB formula of any color. From the Universy Brand website, you can find the formulas for any of our colors. Select OK, and when you’re done selecting your colors, you can name it and Save. From Microsoft Word, go to the Design tab to find the Colors drop down, where you can select and customize your theme colors. Posted in Microsoft Powerpoint, Microsoft Word, Tips and Tutorials. Photos, templates and icons are added all the time to the university’s brand downloads. While notifications can’t be sent out whenever something gets updated, it is possible to see the latest additions to the downloads. For example, we’ve added some new icons this past month. Go into one of the subject folders and arrange them by date by selecting ‘Updated’ above the list. Now you can see the most recent files we’ve added. We’ll send out monthly updates on what’s been added to the downloads, but it never hurts to check often. Thank you and good luck. Posted in Icons, Misc, Tips and Tutorials. In this training session, you will learn how to create branded print materials using PowerPoint. We will demonstrate by building a brochure with step by step instructions. Creating professional, attractive communication pieces is important to conveying information about the important work that is being done. Publisher is a software program that is accessible to many and more intuitive than Adobe InDesign, but it also has its drawbacks. 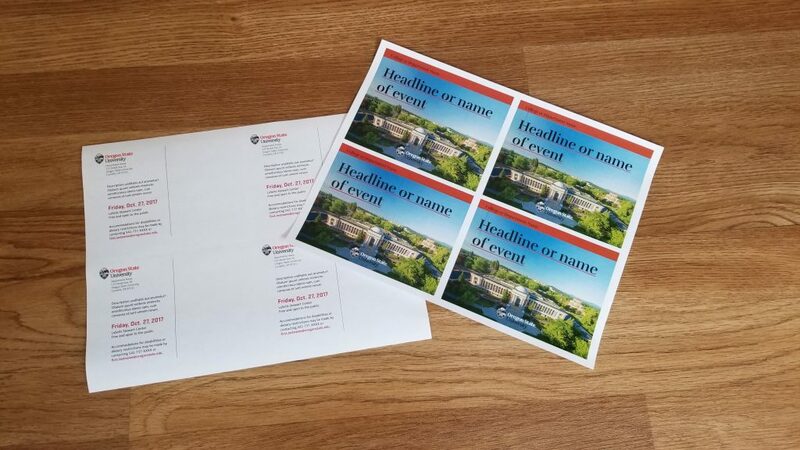 As part of the new OSU brand rollout, University Marketing began developing templates in InDesign and PowerPoint. 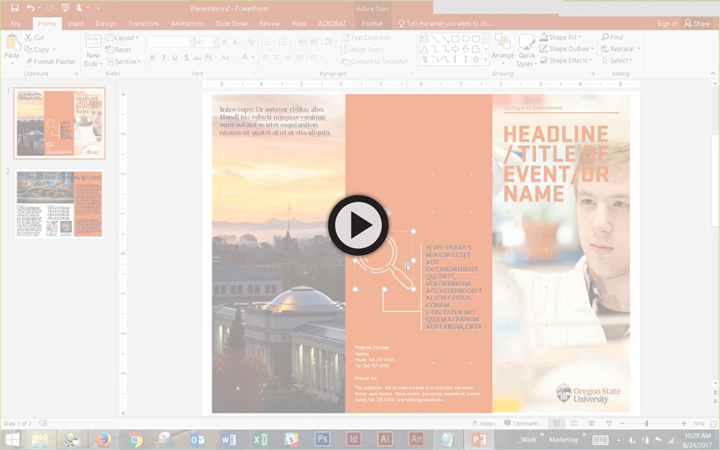 This session is an opportunity see a demonstration on how to use the design tools in PowerPoint to create branded communication and marketing pieces for your programs. It is also an opportunity to learn more about brand elements such as photo style, use of logos, headline and sub-head font choices, and more. Learners should be inspired to look at PowerPoint as an approachable design tool. 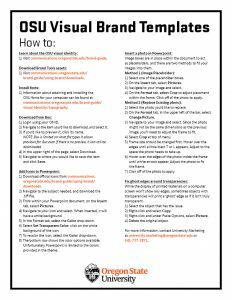 Posted in Microsoft Powerpoint, photos, Tips and Tutorials. Rufina Stencil is one of Oregon State University’s brand fonts, and defaults to using hanging numerals, as seen in the top example. However, our brand calls for using full-height numerals, as seen in the lower example. To change the figures in InDesign, there are a few different options. First is to select the number you want to change one-by-one, and select the full-height numeral that appears next to it. This can also be done one-by-one by going to Window > “Type and Tables” > Glyphs, and double-clicking the correct version. The easiest for us that takes care of all the numbers at once is to create a paragraph style. Go to Window > Styles > Paragraph Styles and create a new paragraph style. Double-click and in the ‘OpenType Features’ tab, next to Figure Style, change to Proportional Oldstyle. Now all numbers in that paragraph style for this document will stay full-height. Microsoft Word also allows you to change numeral height. Select the text and on the advanced Font Options, open the Font dialog box. Go to the advanced tab and next to number forms, select Old-Style. 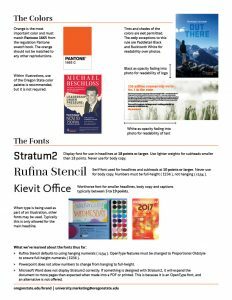 Unfortunately Microsoft Powerpoint doesn’t allow for changing numbers to full height, so we advise if numbers are being shown prominently to use either Stratum or Kievit Office instead. Posted in Adobe InDesign, Fonts, Microsoft Powerpoint, Microsoft Word, Tips and Tutorials. To change a photo that’s locked on the Slide Master, first go to View> Slide Master, and you’ll see all the layout options available to you. These aren’t being seen in the final presentation, but they are the starting place that your presentation bases it’s design on. To change the image, select the picture and go to Format Picture>Change Picture. Locate the photo you’d like to use, and click Replace. Because the photo you choose might not be the same dimensions as a Powerpoint slide, you may need to change the size of the photo to make it full screen. From Format Picture, click crop, and hover over the edges to get your cursor to change to a black T or L.
Expand this to the size of the slide, and then enlarge the photo to fit within. Move around the photo to make sure nothing vital gets cut off, or to leave room for the text to be readable. Click off of the photo to apply the changes. When you’re done, go to Slide Master>Exit Master view to return to your presentation. If your changes haven’t been updated, you may need to use the drop down for Layout and choose the slide with your new image. If you find you’re stuggling with too many folders in your ‘All Files’ in Box, there is a quick solution to make favorites and only use the folders most relevant to you. First, click the ‘More Options’ icon next to any folder, and select ‘Favorite’ on the drop-down. Your favorites can be found off to the left-hand sidebar to view your favorites. For even quicker access, you can create a bookmark in your browser for your Favorites folder, so you can bypass ‘All Files’ completely.